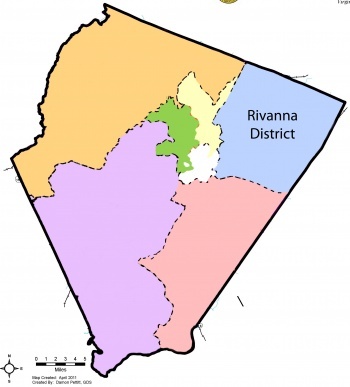 With a southern border defined by Interstate 64, and Richmond Road, the Rivanna district is the easternmost district of the six Magisterial Districts in Albemarle County. The western boundary follows the Rivanna River until it crosses Seminole Trail. Rt. 29 then becomes the western boundary all the way to the county line. Though smaller than the Samuel Miller Magisterial District and the White Hall Magisterial District Rivanna district includes the affluent Forest Lakes and Keswick communities, along with the growing Pantops region, and has a stake in the Rt. 29 and Free Bridge business areas. Norman Dill is the supervisor. Daphne Spain is the planning commissioner. Jason Buyaki is the school board member. This page was last edited on 18 November 2018, at 23:57.